Conjuring Arts’ great friend, Ricky Jay, has just finished writing his latest masterpiece, Matthias Buchinger: The Greatest German Living. Which will be officially published by Siglio Press in March of 2016. As a special commemoration Conjuring Arts and Mr. Jay have collaborated on a limited edition boxed set. 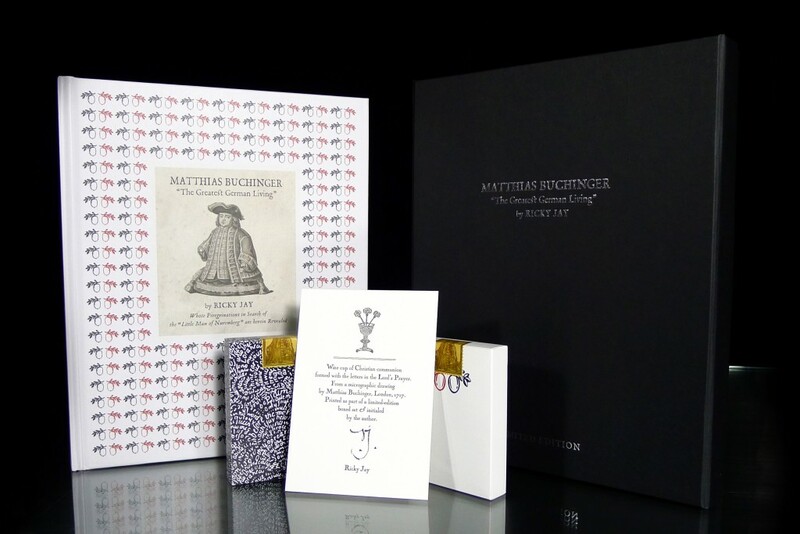 Each set will be numbered and the box closed with a special numbered Buchinger seal. Included in the set is a copy of the book, two different limited edition decks of cards (the seals of each deck will have matching numbers and they will also match the set number) and a hand letterpress-printed special keepsake created especially for this boxed edition and signed by Mr. Jay. This set is strictly limited to a production of 500 of which fewer will be sold. Color illustrations throughout, 160 pages, hardbound. These are now sold out. Through a special agreement with the publisher our books will arrive several months before the actual publication date of the book and our sets will contain the first available copies of the book anywhere in the world. Color illustrations throughout, 160 pages, hardbound.